Dunitz & Company has worked in Guatemala for over 25 years. We've been offering fair trade jewelry to the trade all of this time. I think every year our designs are better and more sophisticated. Heck, we all grow quite a bit over so many years. It dawned on me as I was preparing to start our wholesale trade show season how buyers and trade show staff have changed their views over the years. And change often they have. My business was launched in 1990 at the California Gift Show. Now called LA Market in their World Style / Kentia Hall section. This is where show management placed Dunitz & Company because we were importing from a third world country. It has always been the hallmark section of this show as well. I was pleased. Anyone who attends the LA show has always walked this section. What I learned in the early days as I was designing and developing beautiful on-trend collections is customers really liked what I was doing. My collection wasn't viewed a bunch of indigenous craft but as beautifully designed and colored one that appealed to upper scale boutiques. Buyers at that time often viewed imported crafts as junk. I worked very hard at creating a line that targeted fashionistas and museum buyers. At the time, fair trade was not a word used to describe where and how goods were produced. I always lived by the golden rule and intuitively practiced what is now defined as the principles of fair trade. But then something happened. Trade management told me I no longer fit into the World Style section of the show. Even though my line used traditional artisan techniques my lined looked "too current'. I was told I must move my location to their Fashion Accessories section. (It was not a good move for my business and later to retain Dunitz as an exhibitor the show allowed us to return to World Style.) This is a dance we've had with many trade shows over the years. In current times, several trade shows, such as New York Now have been much stricter about their sections and do not allow exhibitors to move within their defined sections. Their first-world and third-world handmade exhibitors are separated into different sections. Years ago we were all comingled. The third-world Global section at NY Now is a potpourri of companies of which some import indigenous crafts and other create original design. The take away on this is that wholesale trade show management continually change their views on 'what' product is and how it should be seen. As I continued to develop our fashion brand, it was clear my success was a direct result of our good designs. (Yes, I'm rubbing my shoulder here.) Concurrently, buyers were now beginning to learn about fair trade and show interest in supporting companies that treated their artisans well and assured their well-being. [One way we assure our customers that we practice what we preach is by being a member of Fair Trade Federation and a gold certified Green America business. Membership does not come easily and we were carefully vetted.] 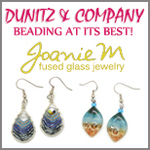 For several years, I continue to think a majority of my customer bought from Dunitz & Company because our fair trade jewelry was and is beautiful. If forced to choose between two lines they were considering, and all other things being equal, a shop would purchase ours given our fair trade practices. Yes! It was beauty first. Fair trade second. Jump ahead a few years. I can honestly say in the current environment, buyers seek out our line and Dunitz & Company BECAUSE we follow fair trade practices. Then they fall in love with our fair trade jewelry designs because they are attractive. (How could they not ;)?) In a significant number of cases now, I think buyers consider fair trade first - before even looking at merchandise. The tides have changed. Store owners and consumers are more interested in fair trade, sustainability and ethical behavior. And of course, I'm thrilled that a huge wave of people feel this way. I'm confident they will continue to be impressed with our designs.